I woke up a few days ago to find that the screen had frozen. The files are still all there underneath, and with a bit of memory I can load up files that I know are on it. I can even listen to them using the audio function. What I can’t do is read them, which for an e-reader is an unacceptable lack of functionality. I tried running the charge down, charging it back up. I reset it. I left it unobserved for a weekend in the hope it would put itself right. It was all in vain, it still doesn’t work. As the unit is 18 months old I think it has gone past its guarantee period so I am left with something that now functions only as an inconveniently large USB storage device. As all my Kindle documents are up in the cloud I can still read them on my phone, but it isn’t the same. It is a real shame. Logically I should just go out and buy another one since the price is low enough that even if it conks out after 18 months I still have got loads and loads of use out of it. And the chances are that I was simply unlucky and that a replacement will last for years. But affairs of the heart are never logical. I feel abandoned and betrayed. I might have to look elsewhere for comfort. Personally, if you're not sure about the Kindle, I'd consider a cheap Android tablet myself. OK, they may be a bit more expensive, but you do get a lot more functionality out of them. Something with good battery life and at least Android 2.3 – the Google Nexus seems to be having good reviews on this – is quite nice. And they do do quite a bit more than Kindle (you can get the Kindle app in the Play store, turns it into a Kindle in seconds). You also have the advantage you can put kobo on as well, which has some of the books at lower prices – as well as other free content I haven't found at Amazon. Be a bit careful buying off Amazon though – anything with a resistive screen means you have to nearly put your finger through it to move anything, and Android 1.anything probably can't be upgraded to a newer version. Thanks Simon. 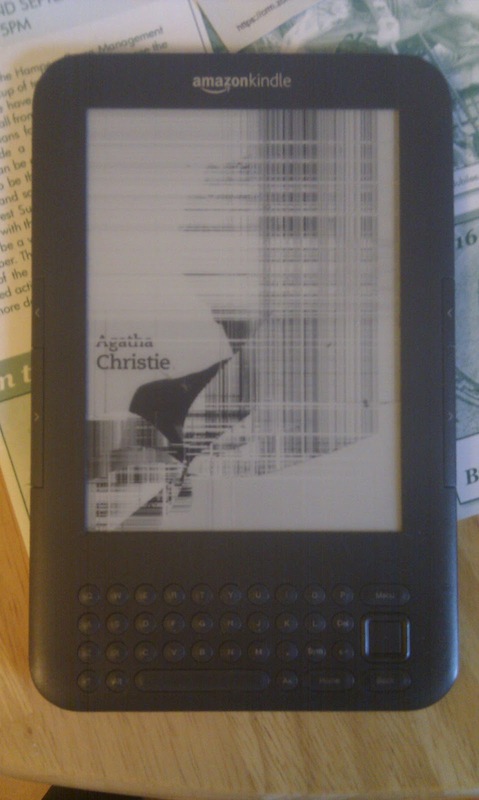 What I really liked about the Kindle was that it had so few functions. This made for fewer distractions when reading and also gave it a phenomenal battery life. It could comfortably handle a multiday business trip. In fact there has been a bit of a development. I complained about my experience to Amazon. They offered to replace it at a very considerable discount. I haven't got the new one yet, but I'll blog my experience.